A popular complementary therapy, Reflexology is a natural, safe and non-invasive healing therapy. 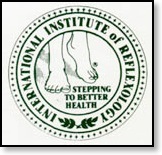 In March 2000, I qualified in the Original Ingham Method of Reflexology with the International Institute of Reflexology (UK). I still love practising Reflexology and seeing clients' health, relaxation and happiness improve! "Heather, we just wanted to say thank you so much for helping us through our fertility problems. We are so lucky to now be having a baby and we don't think it would have happened without the Reflexology treatment from you!" Julie and James, Derbyshire. Reflexology uses the principle that there are reflex areas in the feet and hands which are believed to correspond to all of the glands, organs and parts of the body. Varying degrees of pressure are applied using a number of different thumb or finger techniques. Working the reflexes may help to relieve stress and tension in the body, improve nerve and blood supply and promote the correct functioning of nerve impulses, thereby helping the body to heal and balance itself in a natural way. Reflexology aims to treat the imbalances of each individual and to alleviate and improve symptoms. It does not, however, diagnose a specific medical problem. Sensitive trained hands can detect tiny deposits and imbalances in the feet and hands. Certain reflexes may feel tender to the client and I will vary the pressure used and the time spent on an area according to your reactions and needs. Reflexology is a detailed, systematic and precise method of working the feet and is not merely foot massage. Having removed your shoes and socks, you sit comfortably in a semi-reclined position in a specially designed chair and enjoy the relaxation and feeling of well-being that the treatment promotes. At the end of the treatment you will be given water to drink to aid the expulsion of toxins which the treatment may encourage the body to shed. The first treatment lasts about an hour and three quarters and includes a detailed consultation to find out about your state of health, lifestyle and how you are feeling physically and emotionally. The number and frequency of treatment sessions required will vary depending on the condition being treated, but will always be discussed prior to any treatment plan. Average treatment time is one hour. Reflexology is thought to be a unique method of helping the body to heal and balance itself in a natural and non-invasive manner. 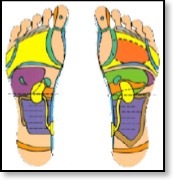 Conditions and problems caused by an imbalance within the body and its systems may respond well to Reflexology. Click here to visit the Treatment Testimonials page to hear how my clients have benefited from Reflexology. Please note that Reflexology is not a replacement for treatment of medical conditions for which suitably qualified medical advice should be sought. Recent changes in advertising regulations mean that even though I have been professionally practising Reflexology since the year 2000, I cannot use any medical terminology to describe the benefits that it may bring you. As a practitioner who takes this therapy seriously, I find this very frustrating; so I thought some published research into the effectiveness of Reflexology may help get the point across. There is a growing body of research available on Reflexology, which makes very interesting and encouraging reading. Click here to visit the research page. It is important to choose a qualified practitioner who has undertaken all the necessary training to understand the theory and practice of Reflexology. The Complementary and Natural Healthcare Council (CNHC), which is supported by the Department of Health, can help when choosing a practitioner that meets the national standards of practice in Reflexology: it has established a voluntary register for complementary healthcare practitioners who all meet the required levels of competence and practice. Heather Hull is a CNCH registered practitioner. “Regulation, whether statutory or voluntary, is about protecting the public. For this reason, the Government fully supports the work of the CNHC. If patients choose to use complementary or alternative therapy, the Government’s advice is to choose a practitioner registered with a reputable voluntary registration body such as the CNCH." Department of Health, May 2009. Westfield Health recognises CNHC registration for reimbursement on a limited number of corporate paid plans provided by specific employers for Reflexology. Clients who wish to seek reimbursement through Westfield Health will need to check that their employer‘s plan covers Reflexology. •	Health Shield will reimburse for CNHC registered Reflexology on specified corporate paid plans. Clients who wish to seek reimbursement through Health Shield will need to check that their employer‘s plan covers the treatment concerned. Reflexology, IIR, AOR, FFR Cert, International Institute of Reflexology, Association of Reflexologists, VRT in Sheffield, Vertical Reflexology treatments in Derbyshire, Finger Free Reflexology, holistic therapies, complementary therapies, alternative health, relaxation, wellbeing, health, peace, calm, wellness, stress reduction, spiritual development, personal development, in Sheffield, Bradway, Dore, Totley, Nether Edge, Ecclesall, Norton, Meersbrook, Crookes, Walkley, South Yorkshire, Dronfield, Holmesfield, Coal Aston, Eckington, Derbyshire, Chesterfield, Brimington, Hasland, Newbold, East Midlands, Peak District, Hope Valley, Hathersage. Re-written 2011 to comply with ASA guidelines - hence the frequent use of the word 'may'!